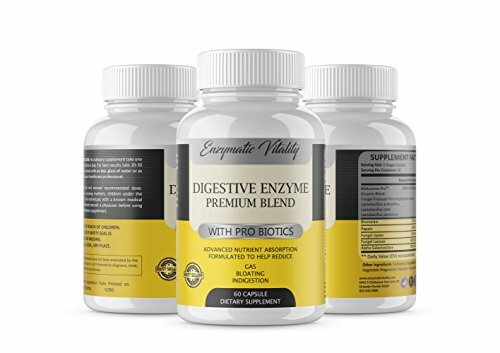 Premium Digestive Enzyme Supplements with ProBiotics. Our digestive enzymes and probiotics help support gut health through assisting the digestion process and probiotics are an essential part of keeping immune function strong. Our Plant based enzyme formula includes Fungal Protease, Lactobicillus Acidophilus, Lactobacillus Casei, Lactobacillus Plantarum plus bromelain, papain and fungal lipase. Fungal Lactase helps reduce lactose intolerance. Digestive Supplements is our calling. We have a passion for helping people feel better with high quality plant based digestive enzymes. Have you ever experienced one or more of the following issues with your gut? Indigestion or Acid Reflux Heartburn, bloating, gas, or burping after even healthy meal consumption. Constipation or diarrhea, weight gain thats unexplained, fatigue? If any of these symptoms sound like yours you may be suffering from poor digestion. The role of digestive enzymes is primarily to act as catalysts in boosting specific, immune system function and providing acid reflux relief, they also help break down larger molecules so that nutrients from food can be absorbed by your body which is an essential part of immune health. Our plant based enzyme formulation was carefully crafted to focus on only natural ingredients in our systemic enzymes. Below is the digestive advantage we provide. More energy, natural weight loss since your digesting food properly, stronger immune system with our best selling probiotic, reduced indigestion and gas. No more lactose intolerance pills. No limitations these can be useful as probiotics for men and probiotics for women as well with added enzymes for digestion, these are super enzymes that provide a wide variety of health benefits. So put your trust in us and make a risk free purchase today! ADVANCED DIGESTIVE SUPPORT & PROBIOTICS SUPPLEMENT – Our Digestive Enzymes are formulated to assist the body with proper digestion. This plant based digestive enzyme breaks down, proteins, fats and carbohydrates reducing fatigue. The result will be better digestion and nutrient absorption. No more digestive issues like IBS, bloating or abdominal problems after eating. This formulation is sugar free, vegetarian and vegan friendly- Non GMO from a company that cares. MORE NATURAL ENERGY: Do you need a cup of coffee after meals? Do you feel super exhausted after a big meal? Our enzymes for digestion will help you break down that big meal that you ate while taking less stress off your stomach which will give your body the boost it needs – Food coma is a real thing” Your system is able to produce more energy and nutrition from every single bite more quickly. You can eat the foods you love while producing essential enzymes for vitality from every bite. INCREASED ENERGY AND LESS FATIGUE -The best way to increase energy is to properly digest all your food. Put only the best in your body without sacrificing on quality. This advanced digestive supplement has all of the necessary enzymes and probiotics to get the job done, with extras like bromelain that aids digestion and fights inflammation. NO QUESTIONS ASKED MONEY BACK GURANTEE – We put people first and healthy living is our passion. If you are not 100% satisfied with our product you have 60 days to return it for a full refund. Did we mention our formulas are independently tested for purity and quality.